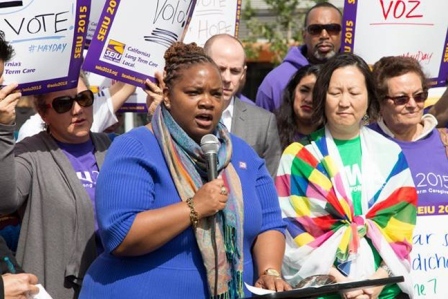 The members of SEIU (Service Employees International Union) Local 2015, the nation’s largest long-term care union representing over 385,000 home care and nursing home workers throughout California, are celebrating the new year with the start of April Verrett as their President. Verrett succeeds Laphonza Butler as President of SEIU Local 2015 after having served as an Executive Vice President of the Local over the last two years. Prior to joining SEIU Local 2015, Verrett was Executive Vice President of SEIU Healthcare Illinois and Indiana (HCII). Verrett has been key in the successful unification of healthcare unions in both Illinois and California to build greater worker power for its members. Such success was evident with the creation of SEIU HCII in Illinois and SEIU Local 2015 in California. “Being a fighter and advocate for working people is my passion,” said April Verrett. “And there is no greater group of workers to fight for than caregivers. As those living in our country and our state are growing older and living longer, we must continue to support and strengthen the infrastructure that allows our loved ones to age with dignity and receive the care they deserve. In California alone, the population of older adults is expected to double between 2015 and 2030 and about half of older adults are in need of assistance for their daily activities. We must be ready to meet the growing demand of caregiving by investing in the workforce and programs that allow our loved ones and their care providers to be treated with respect. “Over the last several months we have fought against multiple attacks on the care, livelihood, and dignity of seniors, people with disabilities, and their caregivers and now more than ever we must continue to stand together to protect what we fought hard to create, such as the Affordable Care Act, Medicare, and Medi-Cal.